I am continuing with the cards from the shoebox swap. This one was made by Sandy. 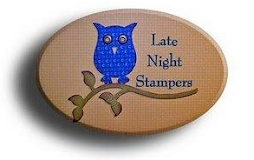 She used the Illuminate Glimmer Watermark Pad on page 23 of Stampin' Up! Holiday Catalog. It is #126857 for $10.95. Now I must confess, I have that pad, but have not used it. After making this card, I know I will be using that pad for a future card. Love how it shines. You cannot tell in this picture, but it is so sparkily (is that a word? ).